Bruschi obtains SMETA 4-Pillars certification in order to give its clients the certainty to have a sustainable production system, certified by Sedex organization. What is SMETA 4-Pillars certification? SMETA is the acronym for The Sedex Member Ethical Trade Audit that has been arranged by Sedex Auditor Group and which aim is to provide information about auditing of companies. In fact Sedex goal is to monitor companies practices and consequently to drive improvements in supply chains. On one hand on Sedex website buyers can have access to suppliers audit in order to choose which supplier is more suitable for them, on the other hand it is an opportunity for suppliers to guarantee to its clients to reach their expectations in terms of ethical business. SMETA has been created to help Sedex members to meet objectives of responsible sourcing within supply chains and to improve the ethical audit effectiveness. SMETA 4-Pillars, as the name suggested, is focused on 4 different areas: labor standards, environmental management, health and safety and business integrity. These area need to be improved by companies in order to respect an ethical behaviour code. Nowadays is getting more and more important for companies to be ethical, for this reason SMETA 4-Pillars certification is fundamental to reach the aim. Being ethical means that a company can comply with all the local labor laws and regulations and that its employees can work in a healthy and safe environment. This is the reason why Bruschi has decided to obtain the certification, to assure its clients to follow an ethical behavior code certified by a specific organization that tests and inspects companies. To ensure a better future for the global business. Obtain brand protection using responsible sourcing: being a responsible supplier means to have put actions in place in order to protect the brand reputation of its clients. An improved supply chain management, that allows Bruschi to be listed in Sedex members. In this way guarantee a sustainable production system to its customers. Reduce costs through standard and shared approach to share audit information: thanks to Sedex website, suppliers such as Bruschi can build an international network sharing information about the result of the certification in order to meet clients’ expectations. Bruschi decided to join Sedex organization as a Supplier member to widen its corporate social responsibility so that could give the certainty to its customers to respect ethical laws and regulations to achieve a better and safer supply chain management. As said before SMETA 4-Pillars certification allowed Bruschi to subscribe an ethical behaviour code. 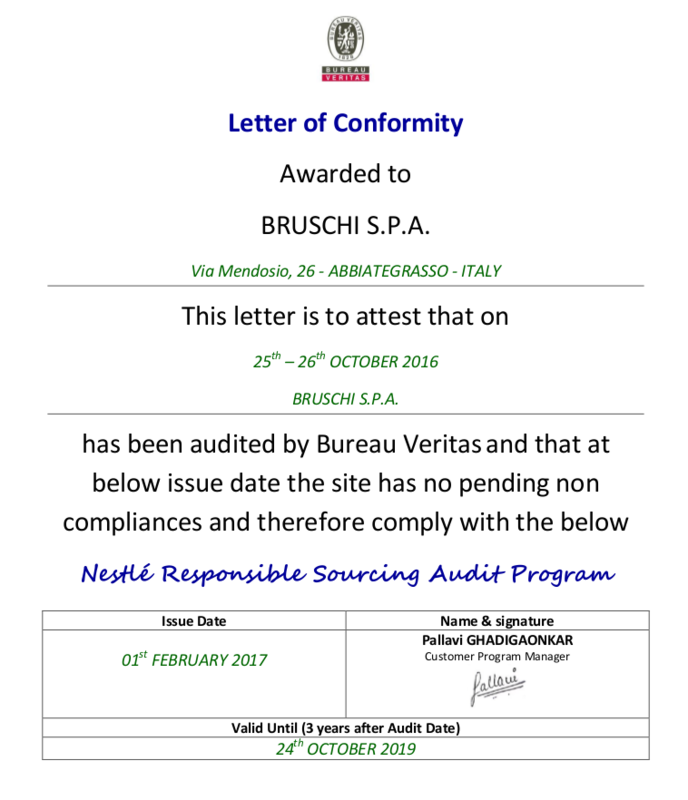 Bruschi obtained the certification due to an audit where Bureau Veritas, authority for certifications, tested Bruschi supply chain management in order to obtain the SMETA 4-Pillars certificate. Sedex is a no-profit membership organization dedicated to drive improvements in ethical and responsible business practices in global supply chains. It is an innovative and effective supply chain management solution, helping companies to reduce risk, protect reputation and improve supply chain practices. For over 70 years Bruschi has been working in industrial production in the field of zinc die casting. Over time Bruschi has distinguished itself for efficiency, accuracy, ability to listen its customers’ needs and its innovative drive in design and technology. Please feel free to subscribe to Bruschi Zinc Die Casting Blog and be always updated on industry news and innovations.